In a new update on We Happy Few‘s Steam page, developer Compulsion Games has given players a summary of the upcoming survival game’s post-launch content. According to Compulsion, these DLC pieces will not be available at launch, but rather, later down the road. First up, We Happy Few will be getting a free update that adds a Sandbox Mode to the game. This mode is essentially “an infinite mode, set in a world that you can customize as you wish (larger, smaller, more dangerous, less food, more Wellies, etc),” wrote Compulsion. “You will be able to customize some of the rules of the game, including choosing to play as a Wellie.” This mode hearkens back to the early days of We Happy Few, when the game was by-and-large a sandbox game. Roger & James in They Came From Below! : Precocious Roger and Impetuous James set off in search of adventure and love, only to uncover bizarre technology and a terrifying new threat. All is not as it seems. Or is it exactly as it seems? We All Fall Down: Much like any well-worn happy mask, all societies develop cracks in their veneer. But that doesn’t mean you should go digging up dirt from the past. Right? *pops a Joy pill* Right! 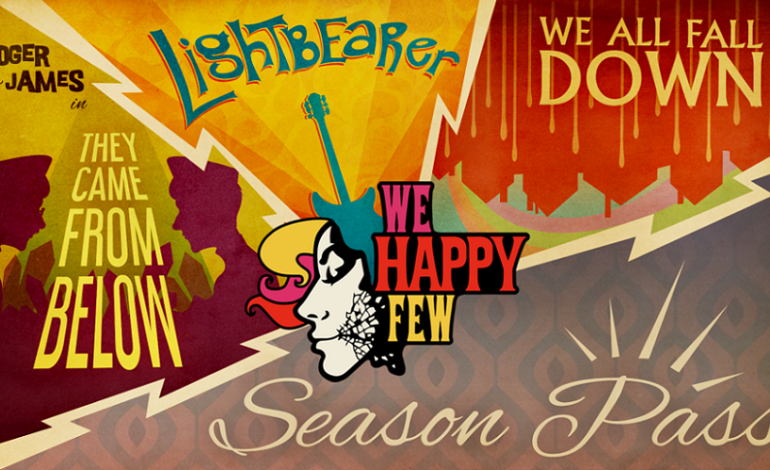 We Happy Few will be launching for Xbox One, PlayStation 4, PC, and Mac on August 10.